Thank you to the collector in Lubbock, TX for the large print purchase! Many thanks to Mason, TX for purchasing a large metal print! Thank you so much to the customer in Littleton, CO that purchased a print of "Tia Rosa Time" plus one of "Tia Rosa's Place" !! Many thanks to the buyer in Greenwood, SC for purchasing the large framed print of "Tia Rosa Time"! Congrats on your sale, Marilyn!......Carry On! 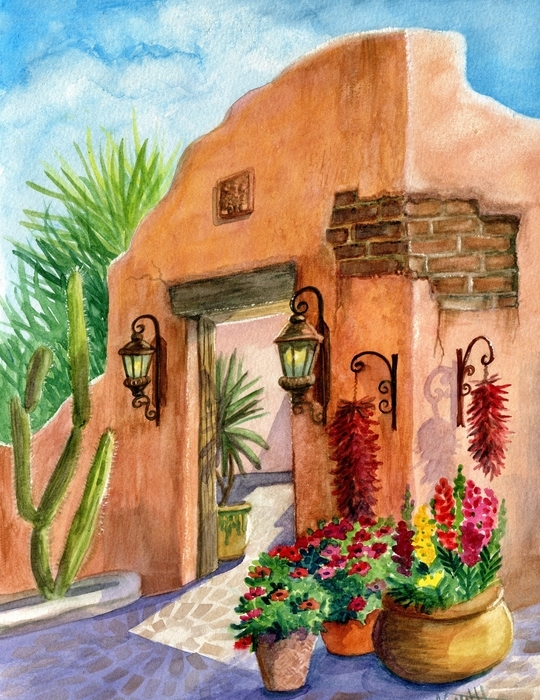 Many thanks to the collector in Scottsdale, AZ for purchasing the original of "Tia Rosa Time" today! Many thanks to you, Doug! One of our favorite Mexican restaurants in the Phoenix area is Rancho de Tia Rosa. 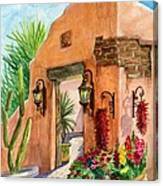 This scene is of the welcoming entrance area to the cafe that is full of charm and old Spanish decor. The main restaurant and cantina is designed to make you feel like you are stepping into a beautiful Mexican Hacienda in the heart of Guadalajara, Mexico. There are elegant fountains, fireplaces, outside courtyards, stained glass windows and tall ceilings with massive hand-hewn beams and lots and lots of wood. 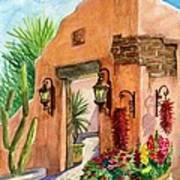 It is painted in bright Mexican colors, with lots of colorful ceramic tile. The entire surroundings are a delight to the senses and definitely invite one to create artwork. This is the third painting in the series of Tia Rosa's place.